It would not be an understatement to say that failure and success have been two key concepts that have defined my life. I know that some of the greatest opportunities for learning in my past have come about from big problems that I have faced and failed to solve effectively. Similarly, the greatest successes have not been arrived at easily and triumphantly but with struggles and stumbles. I have grown and become stronger and more insightful through both the failures and successes. I have not always known this though. When I am in the middle of learning and failing, it does not feel good. I do not like myself very much, and it always seems like a very big deal. My self-worth is on the table every single time. This is not only the case with the failures, but also with the successes, because the successes generally are the final outcome of a series of little failures, negotiations, and little successes -- never the glorious final "perfect" endpoint that I imagined. Sometimes the successes come about from making a second or third attempt to find a solution where I have previously failed. The successes are usually coloured by the failures, relationship dramas, and compromises that led up to them. Therefore, I was pleased to come across this talk by Tim Harford, economist, in which he addresses in a very straightforward and accessible way strategies for how to fail constructively rather than being beating yourself up over them. If you never fail, then you are not setting hard enough challenges for yourself. I have always feared wasting my life. I have always been motivated to make a difference to the world in some small way. This means that I have had to take risks, and with risk-taking failure is more likely. I ask myself, is the pain of sometimes failing worse than the consequence of living a narrow life because of choosing the safe path? If I am to have the courage to fail, it is helpful to have some strategies for acknowledging, coping with, and learning from the failures. Imagine that one day you wake up and discover that you are in the wrong job. It is an epiphany. Suddenly you realize why every Monday morning feels so bleak, why every Sunday afternoon your mood progressively blackens and you end up staying up way too late trying to squeeze a little more time out of the weekend. The arguments that run through your mind -- that you work with wonderful people, that the work you do is a useful contribution, that several improvements in the organization have been accomplished in part by your hard work, that you made a commitment to this job and can't back out now -- seem hollow in the face of your emotions. Anger. Despair. Resentment. You counsel yourself to put your head down and keep working. You repress the angry helpless feelings, and focus in on the specific projects at hand. You nudge, mentor, meet, plan, and present, crossing off tasks until you are able to push another project through to completion. And meanwhile new tasks and projects prolipherate like weeds. Yesterday's finished project is barely noticed; now the urgent refrain is about projects W, X, and Y. Why aren't they finished yet? Working, working, working, and you are another year older, and then another year, and then a decade goes by. What a naive thought to think it could be otherwise. Life ain't a bed of roses. It's about working and pulling your weight. They don't pay you the big bucks to sit around. Who ever said work was fun? But wait! The question is not about working in this job or not working at all. It's not either/or. There are many ways to contribute to the world, and multiple paths to a good life. Although it is typical, once you become part of an organization, to embrace the beliefs of that organizational culture, it does not mean that organizational culture must become your destiny. You have one life, one finite stretch of time on this earth to invent yourself, to flourish, and to find a path on the twisted roads of time. The best you that you can be is the person who will give the most to your community and to the world. Whipping the tired, unwilling workhorse through another tiresome day of never ending tasks is not likely to be the way to your best contribution. Perhaps you are doing good work and perhaps you have made some useful contributions, but if your passion isn't in it, if it doesn't make your heart sing, then it isn't the right place for you right now. By you, I mean me. Dear colleagues, who are surprised and wondering at the suddenness of of it all, please know that for me it wasn't sudden at all. The knowledge was growing in my heart for a long time that I had wandered into the wrong tangled forest. It has taken me a long time to recognize that I needed to act upon my epiphany and make a change. I do not regret my years in this job. I have learned so much, and worked with some great people. But now it is time for me to invent another path, and to work and live with joy and passion. This morning as I was colouring in my adult colouring book, surrounded by soggy kleenexes*, I began to reflect on creativity. Specifically, I was thinking about some of the conditions that give rise to creative thought processes and creative acts. As a child, I always loved colouring books. I especially loved ones with elaborate adventure pictures, fairy tales, pirates, or Ancient Greece. I remember once for my younger brother's birthday party, my mother bought colouring books, one for each party guest, and hid them around the house. At the word "go," the object was to race around the house looking for the hidden prizes. Each child would keep the colouring book he or she found, then help with the search until everyone had a prize. Prior to the books being hidden, I had inspected them and discovered that there was a very appealing Hercules colouring book. I really wanted to find that particular one. 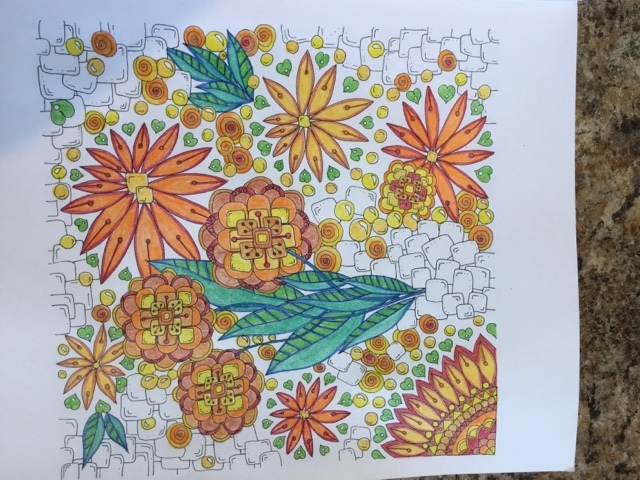 During the game, I ran from room to room finding all of the colouring books. (I was the oldest child present, and also I had a pretty good idea of potential hiding places in our house.) As I found each colouring book, I gave it to one of the party guests, and just kept looking until I found Hercules. My mother was quite exasperated with me for ruining the treasure hunt. "I should have just given you that colouring book to begin with," she said. At some point a couple of decades ago, early childhood educators began to frown upon colouring books. Supposedly, they ruined children's creativity and discouraged them from drawing. It was thought to be so much better for children to create images from their own imagination. This, to my mind, is a misinterpretation of the research findings of the 1980's and '90's on discovery learning. Unfortunately this incorrect understanding was applied across a number of subject areas and teaching practices, to the detriment of a generation of students. Discovery learning is the notion that students are more likely to be engaged in and passionate about learning if they have the opportunity to figure things out for themselves and to use their insights in practical applications. So, to use a mathematical example, children can discover for themselves the relationship between multiplication and division by realizing that just as three groups of four makes twelve, twelve items can be grouped into three sets of four. This mathematical relationship is more likely to be meaningful to them when they discover it than if they are taught the times tables by rote memorization. A practical application, such as figuring out how to share twelve jelly beans equally between three friends helps to anchor the understanding. I very much agree with approaches to teaching that incorporate opportunities for student discovery. Where the pendulum swung too far, however, is that some educators illogically concluded that if discovery approaches were good for learning, then all aspects of structure, memorization, and routine were bad. Out the window went grammar, spelling, mathematical formulas, and colouring books. In came new math textbooks that frustrated a generation of students and their parents by expecting children to guess mathematical theories and principles discovered by mathematicians over the past two centuries by scrutizing colourful diagrams, answering word problems, and responding to open ended questions. As a parent helping my kids with math homework, I remember asking the air angrily, "why can't your textbook just tell you the order of operations rather than trying to make you guess the rule?" I want to bring this post from my grumpy diatribe on teaching methods back to creativity. What I am going to postulate is that creative thought and creative action exist in the sweet spot between structure and freedom. Too much rote copying and stultifying routine smothers the creative spark. Too much structure cages a person within convention and does not grant permission to innovate. On the other hand, too much freedom paradoxically both overwhelms one with too much choice and simultaneously starves the mind because it has nothing to work with. Too much choice -- every artist and writer has been there, I'm sure. What medium should I use? Oils, acrylics, pastels? What size canvas, and will it be canvas board, stretched linen, or a gessoed panel? What colours, what topic, what style of painting? This paralysis can be addressed by learning and applying a few basic techniques. Start by sketching a few thumbnails of the scene to figure out the composition, then do a simple drawing on your canvas. Begin the painting by doing a light wash with transparent colours and solvent, working top to bottom, to block in the main shapes. The wash can be monochromatic to establish the values. Or it can be a pale version of the the local colours that you plan to end up with, or use their complementary colours. Once you have mastered those techniques, you can add new techniques or approaches to your toolbox. You have conquered the terror of the hugeness of endless possibility by doing something. Too little structure provides the mind too little to work with to achieve productive creativity. Think about the advice often given to writers: if you want to be a good writer, then read, read, read. The books that others have written provide the would-be writer content, structure, and instruction. The knowledge gleaned from books (and experience) allows us to build complex mental models of the social, emotional, historical world. Our own unique questions and ideas naturally emerge the more rich and complex our knowledge base becomes. Pursuing those ideas in thought, writing, or through art yields creativity. Reading also immerses us in language, and over time helps us to develop deep linguistic knowledge and appreciation for the nuances of language. By studying texts, we can learn how other writers write. In a beautifully written novel, I can observe how the author has drawn her characters, how dialogue captures the reader and moves the action along, and how those little particulars like the pottery bowl full of agates make the story feel real. The novel, or rather many novels, function as a writing course for a novel writer. The structure of our mental models provides a platform for creative thought and action. We build the structures of our minds by observing and experiencing the physical and knowledge structures surrounding us. The slippages, the tensions, and the mismatches inspire creative problem solving as long as each of us is allowed to have or chooses to have the freedom of agency to act and think. As a final note, I want to point out that studying and observing, although necessary, is not enough. A creative person must also do. Read, read, read, but also write, write, write. Colour your colouring book, but also draw and paint, and try something wild like covering the floor with canvas cloth and flinging paint all around it. Active making, designing, and problem solving are the gifts of freedom. *I have a nasty head cold. I initially wrote soggy tissues but that brought to mind gory images of body parts, so I have used instead the product placement name kleenex that now functions as the common noun for tissue. There they are, the crutches and air boot cast that have been my constant companions for more than four months. They have been dumped unceremoniously in the corner of the front hall, soon to be relegated to the dusty storage room. My metatarsal fracture has healed. I saw the surgeon on January 19, two and a half weeks ago. The X-ray showed that the fracture line was no longer visible; it finally had healed. As I have written before, I stepped in a pothole, turned my left foot, and fractured my fifth metatarsal bone on September 12. 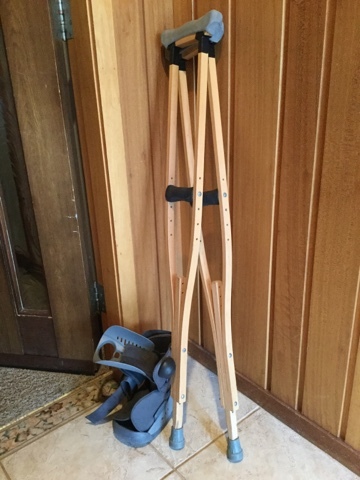 From then until December 17, I was in an air cast and on crutches with no weight bearing -- three months. For the final month, I was allowed to walk in the air cast bearing weight. I am now having to learn to walk all over again. My brain does not remember how to walk. Also, after four months of carrying my weight on my right leg only, and then limping lop-sidedly in the cast, my muscles of the left leg have wasted away. The situation has not been helped by the hours each evening and weekend that I spent on the couch with my foot up, trying to get it to heal. The left foot hurts quite a lot when I put weight on it. I have been going to physiotherapy. I have lost range of motion in my toes and ankle. My plantar fascia is very tight and painful, and my arch is falling. The weakened muscles are not supporting my knee and ankle properly. I likely have some adhesions in the complex architecture of the foot. It was such a strange sensation when I took the cast off and tried to walk. I found that I couldn't balance properly and wanted to carry all my weight on my right leg. My left foot felt like a block that couldn't bend, and I could only take little tiny steps on the left side. My walking was extremely slow and I had to consciously think about every single step -- how to swing my leg, put the foot down, bend it, and weight it equally. People who know me will remember that I am usually a person who person who zips, races, and rushes about at top speed. I have always been athletic, and have taken for granted my ability to balance, bend, turn on a dime, climb, run, scramble up a steep embankment, and walk over rough ground. Right now I don't have these capabilities. I can walk, very slowly, indoors in hallways, or outdoors on flat smooth sidewalks. Stepping over a curb, an angled surface, or a branch, or walking around a bit of snow or ice requires consideration and conscious effort. I have acquired some sympathy for elderly people and other people with mobility limitations who walk so very slowly, now that I have experienced it myself. But every day my ability to walk improves. Four days after I was allowed to walk without the cast, I went shopping at the mall, wearing shoes. I took one crutch with me for balance and to relieve the weight on the left a little. I didn't walk very far -- just around a department store and a little way down the main hallway of the mall. I was on an excursion to buy slippers, as I found it too painful to walk around the house in bare feet, as I usually do. Now I have worked up to outdoor walking, little by little extending the distance. Last weekend, I did two walks around the neighbourhood with Rob, 1.3 and 1.9 kilometres in length. On Thursday, I walked down the hill to a meeting in a distant building and back. My phone app told me that it was 3.1 km round trip, but I think it was incorrect because I have measured that distance before. I think that it was probably more like 2.4 km round trip. I have been wearing my hiking boots or my sturdy Keen walking shoes to work. They provide good support and a sense of security if the parking lot and sidewalks are icy. I am sure that they look a little incongruous with my dress pants, blouses and blazers. Today Rob and I are going to go for a walk in the park. There are extreme wind gusts. But the sun is shining and I am so excited to be able to get out and walk outdoors again.